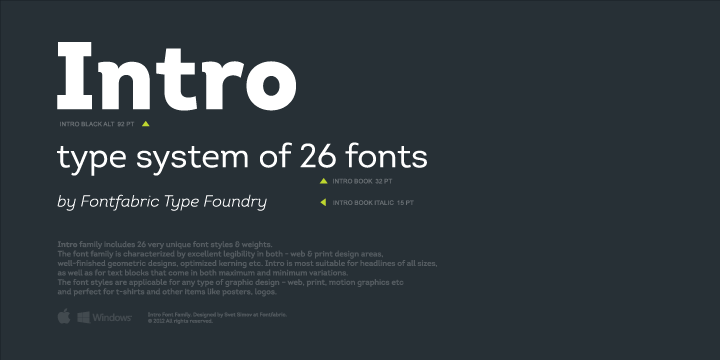 The Intro™ font family comprises about twenty six unique font styles. It is also available in many weights. The typeface family is branded by exceptional legibility both in print as well as on the World Wide Web. A well-refined geometric design and highly optimized kerning make this font as the most desirable one among typeface enthusiasts. Intro is ideally suited for headlines of about all sizes. It also adapts well with a variety of text lengths. Created by Svetoslav Simov, the font comes in varied styles that ensure it the resourcefulness necessary to meet a variety of graphic design challenges.